What Happens When the Culture Collapses? The world’s financial markets went into some measure of panic. How could this be happening without anyone paying closer attention? Leaders across Europe faced enormous economic and political challenges as they decided what to do in response. Economic recovery across the globe seemed to be on shaky foundations. Rumors of profound mismanagement began to circulate across the globe: “The national railroad,” to take just one example, “has annual revenues of 100 million euros against an annual wage bill of 400 million, plus 300 million euros in other expenses.” Not much chance of solving problems like these overnight, the world surmised. I am no expert on Greece, of course, and my point is not to rag on one country apart from my own. But what is so startling for me is something I worry about often: What happens to a society, and even to an economy, when the culture collapses into chaos, when certain values and principles cease to guide the decisions and actions of people? To be more specific: Isn’t it possible to ask whether pervasive dependency on a government on the dole is damaging to individual initiative? Doesn’t the glittering prospect of easy credit/easy money take something away from individual responsibility? When the bright line about cheating grows dim, isn’t it possible to spot the signals of a damaged and collapsing culture? I find myself wanting to dig down to relocate some pretty important principles, moral principles that translate into economic principles, perhaps economic principles that reinforce strong moral principles. We might call them American principles, but I am happier reaching even further down to call them Christian principles. I am thinking here of the kinds of principles that have helped to shape our American way of life over time, notions of hard work, self sufficiency, personal responsibility. I am also thinking about honesty and integrity. I worry these days that we may have crossed that bright line that defines what it means to be truthful. I worry that our young people may cross those bright lines without even knowing it: “After all, everyone does it, cheats a little, breaks a code of honesty, violates a behavioral standard defined by a community. Who cares? Everyone’s doing it. It’s the only way to get ahead” — if these ever become the normal ways to describe our economic and personal decisions, we are in deep trouble. We worry this morning, to be sure, about how to restore economic prosperity. But we’ve also got to be thinking hard about how to create cultural prosperity. What will it take to re-alert ourselves to the moral bright lines? What will it take to realize that crossing those bright lines is dangerous and profoundly damaging, and that course corrections for the culture may be more difficult that economic corrections? I find myself thanking God for Seattle Pacific University, a place that tries to model cultural engagement of this sort, and in so doing, seeks to make the world a better place. Culture can mean a great many things to people, but what I mean here is a specific very important element of culture: how people relate to each other face to face. Take honesty, for instance: do people demand it of themselves and others, or do they feel that it is acceptable to lie to get what you want? I’m from the UK and think that the whole ‘Euro’ idea is an ongoing financial disaster. It was a good idea at concept, but the reality is far from the cornucopia we all thought it was going to be. It’s not a good feeling when you have to help pay another countries debt that you didn’t incur. Greece and Ireland have been bailed out, and it looks like Portugal is on the brink of needing a bail package. They’ll probably get it because of the obvious dominoe affect to Spain and other surrounding countries. Let’s get out of it and give people their country and currency back. It is sad to even imagine the things that could actually happens when our culture collapses. I think it is best to just find the right solution for the problems that our government has to avoid something terrible. This piece touches on a great point we as Americans should be privy to: when the politicians say we’re saving 1 trillion, we’re lucky if we’re actually saving half a billion. And when they say it’s going to cost half a billion, it will really cost a trillion. A well written, thoughtful piece. Very well put. So many other cultures feel due to moral depravity (e.g., Babylon, Greece, Rome). I am hoping that our country gets it soon otherwise we, too, will pass away. Thank you for your moral courage. Interesting article, especially in light of the collapse of the government in Greece. I feel the whole world is in trouble, the United States is, we just won’t admit it, and now all the unrest in the Middle East. People that do not believe in the second coming have blinders on. You can follow everything that is happening in the world today in the scripture. Thank you for this article. Interesting that I stumbled onto it today. I have many Greek friends, who live in the US now, but have family, and property back at “home” in Greece. None of them seemed to surprised by this when news first started popping up quite a while ago. Thanks for the post! I enjoyed reading your article and it’s true we have to get back to Godly principles in government. The government and Godly principles go to together to seperate church and state was the biggest mistake ever made. That is why there is no integrity and so much corruption in government. We are definitely already in deep trouble and I cannot see any other way out but for the current form and practices of our government to be completely reformed. We need to send all of the “lobbyists” home and outlaw that because it is doing nothing but adding to corruption in politics. We also need to have all donations for election campaigns be run on a party-wide level and outlaw the practice of donating money to one persons election campaign. I have a friend who plays basketball in Greece and is from the states. He said it’s getting pretty bad over there. Worse that what he saw when he was in the states. Hopefully they can pull through this soon. Is living with integrity even possible within our current culture? Even when we try to live with the most honorable intentions, the very culture that we are caught in makes that impossible. Our daily lives destroy the very eco systems that we depend on. The services that enable our daily lives operate without regard to the welfare of other species. Perhaps you are familiar with the Zeitgeist films? A resource based economy (without the need for money) is the vision explored in the films. Some say it’s an unobtainable utopia, but I would say that if we are to strive toward something, then why strive for anything less! I don’t think Greece is going to be the last country in financial crisis. I can see this financial crisis extending beyong Europe. If Charles Rangel and others are an example of ethics and morality in our leadership then the US of A is not far behind Greece. How does a man enter Congress from the military and amass a multimillion dollar estate over 40 years. If the trading portfolios of our Congressional leaders were ever made public we would find the answer to that question, and rioting in our streets. I find it curious when I read “How could this be happening without anyone paying closer attention?”, yet the writing has be clearly on the wall for sometime. It just amazes me that the current administration with all of their resources can NOT make the right decisions, but instead forges ahead and compounds the problem. It disturbs me to say, that I think this is still the tip of the iceberg. I am usually the eternal optimist, but now, my cards are off of the table. I hope I am wrong! 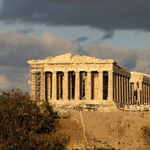 What happened in Greece is a testament to the power of perception. One day Greece is a good risk, the next it is not. Nothing changed but perception. The fundamentals are the same. Would be nice to think that perception is always based on solid things, wouldn’t it? A great article! The decay of the moral fiber of our country will ultimately result in the collapse of our country. The only hope for our country is to turn from our morally corrupt ways. Is the United States on an inevitable slide into moral, political and economic bankruptcy? I recall the same cries of alarm and dire predictions during the administration of Franklin Delano Roosevelt. And yet, the Nation survived and prospered. History gives perspective on current crises. Probably our Nation was most corrupt during the Grant administration, and yet since then we developed rules and practices which, at least in part, civilized our governmental actions. Over the years, we have been able to expand both democratic participation and distributive justice. The lack of civility in current political debate is shameful and often shameless — and it’s worsened by our instant electronic methods of world-wide communication. But, we have not yet descended into the foul pit of political defamation which we experienced during the first fifty years of our National history. They effectively ripped each other up with only broadsides and newspapers, small in both size and circulation. We rightly fear the moral and economic decline of American youth, and their lack of initiative. Yet, our long-term economic growth and prosperity probably depend on the very people we fear and exclude — immigrants from Latin America and Southeast Asia. Almost every one of them is an entrepreneur. However, Seattle Pacific University is to be commended for pushing against the strong tide of our National drift. A final word of encouragement. In the long-term, nobody has prospered yet by selling the United States short. Wonderful commentary. I have never seen this spin on national debt, but find it very interesting. This could be the underlying cause of national debt, which is but a symptom. I can only speak of my own country (The US), for it is the only one I know at depth. Our country was founded on principles, and they are in all of our founding documents. Inevitably as time passes it is easy to live astray from these principles. The sense of urgency declines as stability becomes a commodity, whereas during the days of the Revolution principles were a necessity. I think a culture is only as strong as their principles are and the societal adherence to them. Thank you again and looking forward to a thoughtful discussion. Considering the corruption and lack of moral fiber of so many U.S. government figures, the escalation of negative campaign ads, and the ability of foreign corporations to influence political races with their donations, I fear that our culture here in the U.S. is, indeed, on the verge of collapse. A year ago I attended a seminar for Christian businesspeople in a country where corruption is quite normal. The seminar was led by an American and among other things encouraged business people to not participate in corruption ( corruption defind by the American as ” what was not legally allowe). One of the business people turned to me ( a white middle age woman with a degree in theology) and told me: I am in construction work with the government. When I want to get an assignment(work) done, I need permits. My work, in order to get paid needs to follow a strict time limit. Permits are never granted in a reasonable time, when at all. In order to get the assigned work done, I have to pay (someone off). What shall I do? Employment change is not an option for this man. He is caught in the cycle of corruption, just like others, on a smaller or bigger scale. I understood the dilemma of this very sincere Christian. I really could not give him any advice, except that he and his other Chrsitian business people need to gather and find a solution/resolution in which they can hold each other accountable and still would be able to do their work and support their families. I strongly believe that what we see in Greece and in the U.S. and in other foreign countries corruption and lies are affecting the lives of billions of people. It requires a transformation . model alternative ways of doing economics, community, healthcare etc. Hi, This is a very nice blog to read. While Greece battles its debt crisis, Iceland – where major banks collapsed in the wake of the global financial meltdown – is gearing up for a referendum on whether its taxpayers will shoulder the burden of paying back billions of dollars of debt. The problem of the crisis in Greece is that political leaders hid the crisis to the people. After many years of lies and corruption is logical that the country is rebelling against their leaders.